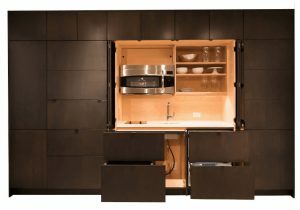 (Catasauqua, PA – September 18, 2017) YesterTec brings its U.L Listed technology into the kitchen with an award-winning line of module-based cabinetry called Stealth Kitchen Modules that allow a fully functional kitchen to be completely hidden from view. Similar to their popular kitchen workstations that are housed in freestanding furniture, the Stealth Kitchen Modules collection is more like built-in cabinetry with a variety of beautiful finish options that complement and blend perfectly into any décor. 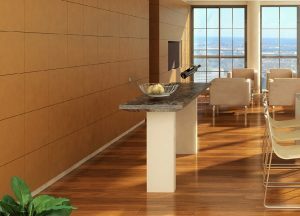 They are a wonderful design solution for a sophisticated urban penthouse looking for a true minimalist vibe or for an executive boardroom that needs a hospitality station tucked out of sight. 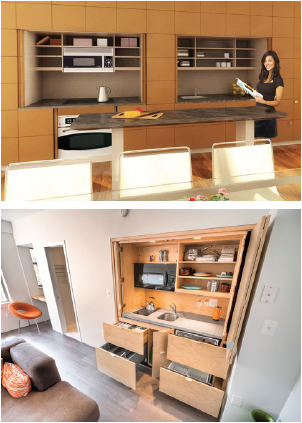 Stealth kitchens are well suited for full-sized residential kitchens as well as hotel suites, apartments, game rooms, basements and more, offering the convenience of close-at-hand kitchen amenities and the luxury of being able to hide them neatly away behind closed doors. With nearly endless possibilities to choose from, Stealth Kitchen Modules offer an impressive array of design options. The modules can be configured into an L-shape or galley kitchen, as a straight line or with a peninsula. Most are an impressive 29” deep, offering expanded storage capabilities without consuming valuable frontage. The range module features a 30” oven and cooktop as well as a microwave or optional second oven. The sink module includes a full-sized dishwasher and large sink, while the refrigerator/freezer modules can accommodate integrated refrigerators from several manufacturers. There are also storage and working pantry modules with abundant shelving, drawers, and countertops. The concealing door and drawer panels can be painted or stained wood, plastic laminate, or even hidden behind digital graphics to produce a wall-sized mural or Trompe L’oeil effects. One of the most notable features of YesterTec’s Stealth Kitchen is their patented safety technology. Their U.L. Listed pocketing door system allows the ‘hot’ appliances to be operational only when the module’s doors are open and stored securely in their pockets. This smart precaution eliminates the potential fire hazard of a hot appliance behind closed doors. YesterTec is proud to be on the cutting-edge of this technology – their development of this system was an industry first. Discover the ease and convenience of the Stealth Kitchen by YesterTec. There is a design to complement every décor, from rugged log cabins to modern condos to beachfront villas. Each unit is beautifully finished inside and out and can be customized to meet the requirements of any setting. For more information about Stealth Kitchen Modules, visit yestertec.com.